Is Scroll Lock ON or OFF now? Many laptops and wireless keyboards either don't have any indicator for Scroll Lock or have it located in an inconvenient or hidden place, under a hand for example. So knowing the actual state of Scroll Lock, especially after accidental key pressing is a huge problem! You can easily solve this using Scroll Lock Indicator software. 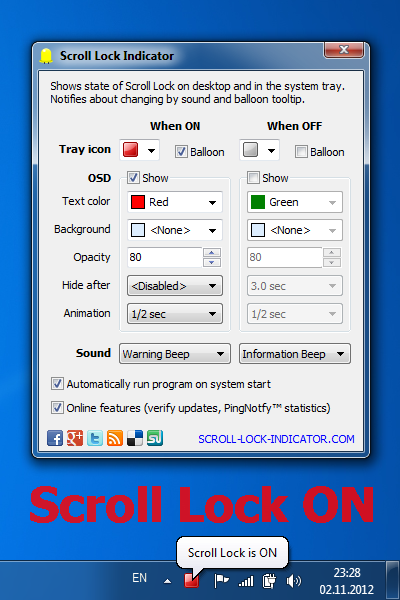 Moreover, you'll be notified with different sounds when Scroll Lock is turning On and Off! Also you can get a license as a gift for sharing information about this great software, suggesting a cool feature or finding a bug.